First Sentence: The Cross house was twenty paces away and the proximity and sight of it made Gary Soneji's skin prickle. Reason for Reading: I wanted the comfort of a series read (and to at least make an effort towards my catch-up goal before the end of the year). I set four books in front of me, each one pretty much the same type of book. I posted on a yahoo book group I belong to my choices and overwhelmingly the response was to read the James Patterson novel. Even my husband cast a vote for it. 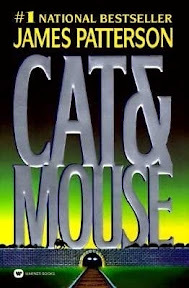 Now, it could be that that was only because Cat & Mouse was the only book among the four that most everyone is familiar with. Regardless, I knew this was the time to re-visit my old friend Alex Cross and see what dangers he faced this time. Synopsis by Amazon.com: That monstrous villain Gary Soneji is back in Cat & Mouse, the fourth book in James Patterson's series about Alex Cross, a police forensic psychologist, but he's not alone. In seeming support of the premise that you can never have too much of a bad thing, Patterson has thrown a second serial killer into the mix: Mr. Smith, a mysterious killer terrorizing Europe while Soneji practices his own brand of evil along the Eastern Seaboard. With two killers to track, Cross has his hands full--and Patterson has another hit. Comments: It has been a long while since I last read an Alex Cross novel, much less a James Patterson novel. I knew that I could count on his novel to be suspenseful and thrilling right up to the very end. With an occasional slow down for Alex to try and fit in his family and love interest, Cat & Mouse was the fast paced thriller I expected. In two seemingly independent cases, Patterson brings them together in a way the reader will more than likely not anticipate. Alex is at the top of his game, putting his psychology and law enforcement backgrounds to good use as he tracks down two vicious killers who seem to have engaged him in a game of cat and mouse, which puts not only him, but also is family in the gravest of danger. Favorite Part: I loved all the author and book references throughout the novel. I’m a book junkie, what can I say? I have always been a big fan of Alex’s family. It is no wonder Alex finds so much comfort and peace with his family. Miscellaneous: With just five pages to go, I heard a loud crash as two vehicles slammed into one another not too far outside my house. I ran to the window to see what had happened, and Hubby reached for the flashlight to offer assistance redirecting traffic. I watched as neighbors flocked out of their houses and down the street to see the action. It reminded me of a much more gruesome scene from Cat & Mouse that I’d read earlier today, about how the hundred's of people all came out to watch the authorities comb Parc de Montsouris in France for a dead and most likely mutilated body at 2 a.m. in the morning. One other thing: I know, I know. I am not supposed to try and figure out part of the whodunit, but I did. Immediately. Fortunately, I’m not the kind of person who is disappointed by a book just because I figure it out early on. I enjoy those Alex Cross books...don't think I've read this one! I'll add it to the TBR Mountain for sure after your great post. Heather ~ Thanks! I'll probably be reading more in the series soon as I try and catch up with my series reading. Alex Cross is such a great character. I want to try his other series (with the female lead characters), but I haven't gotten around to it yet. I hear that series is great. Nessie ~ It's overwhelming sometimes to think of all the books out there and available for us to read, isn't it? Definitely too many to fit into a lifetime or even two or three! If you ever find yourself reading a James Patterson novel, I hope you will enjoy it. Patterson's novels are placed in the general section in stores in my part of the world too. Genre categories are so ambiguous. I'm sure it had to do with marketing or something similar.